I learned how to make a rich Alfredo sauce from a chef named Rose while in college at WWU. I was working at Sadighi’s, an outdated “fine dining” restaurant ran by Mr. Sadighi and his 70 year-old chef Rose. If you’ve lived Bellingham, you know which place I’m talking about. I was the hostess/busser/official napkin folder, but we never had more than six tables (total) on a Friday or Saturday night. Evenings were spent in the kitchen with just the three of us, and if I was lucky, Rose would make me dinner. She made the sauce from scratch with just a pan, spatula, fresh cream, garlic and a touch of dijon. The result was heavy, coma-inducing and delicious. When I took the first bite of this vegan version, it immediately took me back to that small kitchen and those weekend nights spent with Rose and Mr. Sadighi. It’s that kind of rich. In a bowl, cover cashews with cold water, cover and place in the fridge to soak over night. Drain and rinse the cashews once softened. In a Cuisinart or Vitamix, add cashews and cover with fresh water, about an inch above the cashews. Blend until very smooth. Set aside. In a large pot, boil pasta in salted water until just al dente. Set aside 2 cups of pasta water and drain. In a large saute pan, saute shallot in olive oil over low/medium heat until tender. Add garlic and continue to saute. Add 1 cup of pasta water and stir. Add pasta and add an additional cup of pasta water. Add cashew cream (I used about 1/2 cup and an extra 1 Tbsp, but add more/less based on your taste). Stir the pasta with the cashew cream until coated. Salt and pepper to taste. Add fresh basil and parsley, continuing to stir over low/medium heat. Feel free to add more pasta water if the sauce seems too thick for your liking. 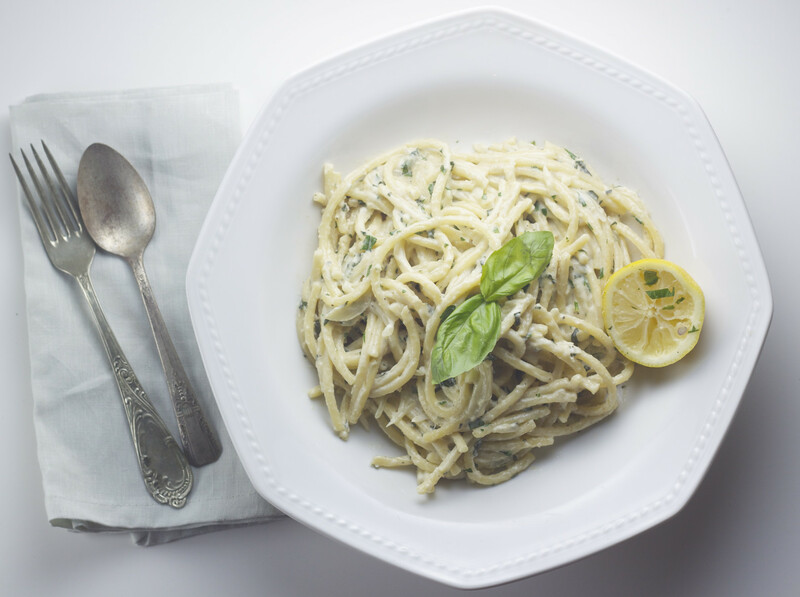 Once the pasta is well incorporated with the sauce, season again to taste and squeeze lemon juice over the top of the dish. Don’t be too heavy handed – you can always add more lemon to taste. Serve immediately. You’ll have leftover cashew cream. Explore the different ways you can use it!